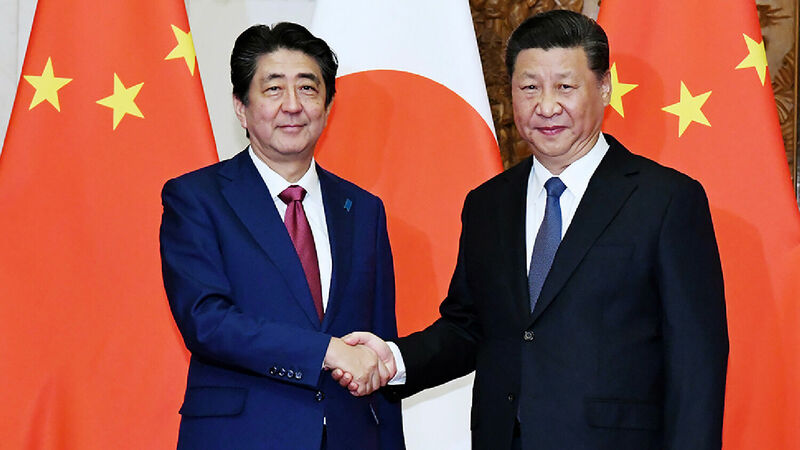 China and Japan are setting aside their differences and laying the groundwork for collaboration on numerous projects connected to Beijing’s ambitious Belt and Road Initiative. The Belt and Road Initiative is a Chinese project aiming to rebuild the ancient Silk Road trade route by enhancing connectivity and transport infrastructure along the thousands of miles between China and Europe. For years, Japan was among the most outspoken critics of the initiative. In 2015, Prime Minister Shinzō Abe went so far as to launch an alternative plan for Asian nations, focused on constructing “high-quality” projects (a criticism of the perceived shortcomings of some Chinese-built infrastructure). As recently as this May, Japan’s Takehiko Nakao, who is currently head of the Asian Development Bank, cautioned smaller nations about “debt sustainability issues” associated with accepting easy money from China in return for concessions to the Belt and Road Initiative. The most notable sign of Japan’s “oscillating” into a position of sudden willingness to collaborate on the Belt and Road Initiative came during Prime Minister Abe’s visit to Beijing from October 25–27, where Chinese Premier Li Keqiang formally invited Tokyo to assist in the project. Representatives from Chinese and Japanese companies and universities were present and agreed to work together on more than 50 infrastructure projects in other countries. China and Japan moving toward cooperation on the Belt and Road Initiative is significant partly because of the historic rivalry between the two. This animosity is mostly due to Japan’s ruthless invasion of China in World War ii, which left 200,000 Chinese civilians dead. That violence from a lifetime ago remains, in the collective Chinese memory, a fresh humiliation. And the anger has been intensified by the sentiment among many Chinese that the Japanese have never sufficiently apologized for their empire’s cruel wartime behavior. Japan and China also have ongoing territorial disputes over the Senkaku–Diaoyu Islands and parts of the East China Sea. In light of these hostilities, the fact that China and Japan seem to be laying the groundwork to collaborate on the Belt and Road Initiative could represent a dramatic geopolitical shift. The Belt and Road Initiative is bringing China and Japan together and laying the groundwork for a major increase in trade between these nations and those of Europe. In both of these areas, it is leading to the fulfillment of specific Bible prophecies. Journalists sometimes mention the biblical word Armageddon found in Revelation 16:16, but it is rare to hear talk of “the kings of the east” discussed in verse 12 of that same chapter. The Bible shows that these “kings of the east” will be a massive bloc of Asian nations that pool their militaries together in the end time. They do this in order to confront another power bloc led by Germany. Revelation 9:16 says that the Asian army will be comprised of a jaw-dropping 200 million soldiers. Some specific details of how this Eastern superpower will form in the end time are still unknown, but prophecy is unmistakably clear about the fact that it will happen. And, though it will be led by Russia and China, Ezekiel 38:6 specifies that “Gomer” and “Togarmah” will be part of this power bloc, and lend their military power to it. These are ancient names for the main peoples who make up modern Japan. Another prophecy in Isaiah 23 forecasts that a “mart of nations” will form in our lifetime. This is describing an enormous economic partnership. And Scripture shows that the lead players will be Chittim (an ancient name for modern China) and Tyre (a city representing modern Europe’s commercial center). A related passage in Ezekiel 27:14 says this partnership will be joined by “Togarmah,” an ancient name for the modern people of Japan. These scriptures show that the economic powerhouses of China, Europe, Japan and others will work together to control global trade. Deuteronomy 28:52 shows that this “mart of nations” partnership will operate to the detriment of America: “And he shall besiege thee in all thy gates, until thy high and fenced walls come down, wherein thou trustedst, throughout all thy land: and he shall besiege thee in all thy gates throughout all thy land, which the Lord thy God hath given thee.” Other scriptural passages such as Habakkuk 1 show that the power besieging America will be a German-led European conglomerate. Isaiah 23 shows that this European entity will accomplish this prophesied besiegement with China’s cooperation. Ezekiel 27 suggests that Japan could also be a key player in it. The importance of the increasing cooperation between China and Japan, and the progress of the Belt and Road Initiative, is revealed in these Bible prophecies. In the near term, these developments indicate a dark future for America and some of its allies. But the “mart of nations” and the looming conflict connected to it will be followed by the most peaceful era in mankind’s history. “[W]hat a dynamic market of nations it is,” Mr. Flurry writes. “All of them are going to besiege America, Britain and the Jewish nation. … But that trading partnership won’t last long. Soon they will clash, just before Jesus Christ returns and destroys both of them” (ibid). The same Bible that accurately prophesied the 21st-century mart of nations now developing prophesied that shortly after this bloc emerges God will intervene in world affairs. These developments are leading to the return of Jesus Christ. He will bring a decisive end to mankind’s self-inflicted chaos and usher in an age of peace for the people of China, Japan and the whole world.